Wehrmacht Panzerjacke for tank crews, non-commissioned officers and officers. The wrap is double breasted, of hip length, and was cut so as to produce a snug fit, with little to catch on the interior of the armored vehicle. Badges are sold separately, please select your rank for sew the badges you want..
By buying this product you can collect up to 67 loyalty points. Your cart will total 67 loyalty points that can be converted into a voucher of 1,34 €. Include : Breast eagle, collar patches with metal skulls, shoulder boards panzer and sew service. Include : Breast eagle, collar patches with metal skulls, shoulder boards panzer, Obergrenadier badge and sew service. Include : Breast eagle, collar patches with metal skulls, shoulder boards panzer, Gefreiter badge and sew service. Include : Breast eagle, collar patches with metal skulls, shoulder boards panzer, Obergefreiter badge and sew service. Include : Breast eagle, collar patches with metal skulls, "Unteroffizier" shoulder boards panzer and sew service. Include : Breast eagle, collar patches with metal skulls, "Unterfeldwebel" shoulder boards panzer and sew service. Include : Breast eagle, collar patches with metal skulls, "Feldwebel" shoulder boards panzer and sew service. Include : Breast eagle, collar patches with metal skulls, "Oberfeldwebel" shoulder boards panzer and sew service. Include : Breast eagle, collar patches with metal skulls, "Stabsfeldwebel" shoulder boards panzer and sew service. Include : High quality breast eagle, Panzer collar patches, "Leutnant" shoulder boards and sew service. Include : High quality breast eagle, Panzer collar patches, "Oberleutnant" shoulder boards and sew service. Include : High quality breast eagle, Panzer collar patches, "Hauptmann" shoulder boards and sew service. Include : High quality breast eagle, Panzer collar patches, "Major" shoulder boards and sew service. Include : High quality breast eagle, Panzer collar patches, "Oberstleutnant" shoulder boards and sew service. Include : High quality breast eagle, Panzer collar patches, "Oberst" shoulder boards and sew service. Army Panzerjacke has all the details of the original. It is exactly reproduced in black wool from the original pattern and has the correctly angled front closure found on all originals. The collar, as well as the death's head collar tabs of the Panzerwaffe. The jacket is lined in brown twill as were the originals. Two belt suspension tabs are provided to carry the support hooks for the waist belt. This is the premier reproduction Panzer jacket on the market today. 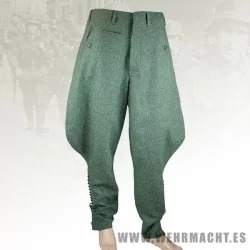 Since it's made from the original pattern, it also fits exactly like the original, with a narrow back and small armholes that encourage the wearer to assume the correct military posture. With keyhole buttonholes made on period wartime original Reece buttonhole machines, as used by the Germans, and the characteristic three stitches per centimeter, even the sewing details of this Panzer jacket will pass the closest inspection.